And now, before the serious stuff, something completely different, as Monty Python used to say. This is a short video I found on YouTube from the Inside Edition channel. It’s their report on the successful flight of a steam-powered rocket, built and crewed by ‘Mad’ Mike Hughes. Hughes is a limousine driver and a self-taught engineer. His reason for building the vehicle is, er, eccentric: he wanted to see if the Earth was flat. The video was posted on 18th March 2018, and shows Hughes and his rocket taking off in the Mojave desert in the south-western US. It climbed to an altitude of 1,850 feet before finally returning to Earth, its descent slowed by two parachutes. Hughes had spent ten years building it, and the video shows stills of early versions of the rocket. Hughes’ landing was rough, however. The video describes it as a crash. A rescue team got him out of the cockpit, but he complained that his back was broken. When the news crew caught him with him to talk, ironically just outside a courthouse where he’d been giving a ticket for speeding, Hughes’ claimed that he might have a compressed vertebra. The video ends by reassuring its viewers that, yes, the Earth is indeed flat. I’m actually saluting this bloke, because he’s obviously really clever and has done something I’d love to do myself: build a low power rocket that could hold a man or woman and send them up to a reasonable height. Way back in the 1990s I had a paper printed in the Journal of the British Interplanetary Society arguing for the construction and flight of such vehicles as a new leisure industry. I based this on the use of hang-gliders, paragliding and microlight aircraft as hobby aviation. People fly them because they want to enjoy the experience of powered flight, not because they actually want to go from A to B. In the same way, I feel, human-carrying rockets could be built and flown to give ordinary people something of the experience of astronauts going into space aboard real rockets, like the Space Shuttle or the Russian Soyuz craft. But obviously without having to spend millions on a ticket to space. Steam, or hot water rockets, have been around since the 19th century. The first modern hot water rocket was patented in Britain in 1824 by the American inventor, Jacob Perkins (1766-1849). The American Rocket Research Institute, based in California, and founded in 1943, established a special centre for the research and construction of hot water rockets, the Perkins Centre, named after him. The Institute runs a number of training programmes for students and aspiring rocket engineers. The rockets developed could carry payloads up to 5,000 feet. After the War, the German rocket scientist, Eugen Sanger, and his wife Irene Sanger-Bredt, carried out research into hot water rockets to see whether they could work assisting heavily loaded aircraft into the air. The main US researcher in the area was Bob Truax. The rocket engines developed by the RRI ranged from senior student college engineering projects with a thrust of 700 lbs per second to the Thunderbolt II constructed by Truax Engineering, which had a thrust of 16,000 lbs per second. 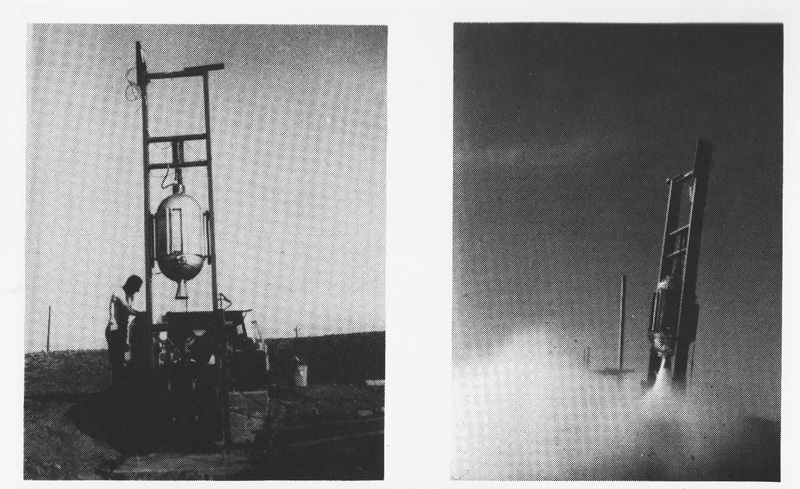 The photo below shows the STEAM-HI III hot water rocket being installed at the Perkins Safety Test Centre in 1963. 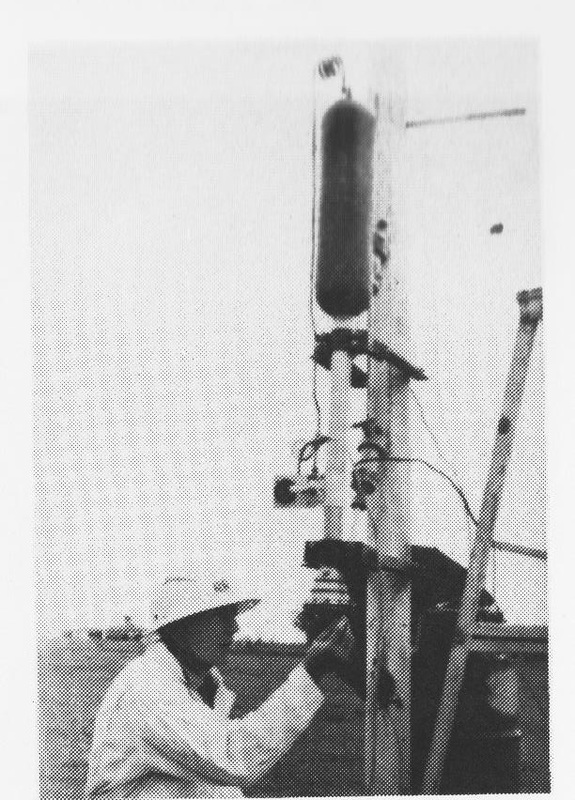 This photo shows Truax Engineering’s Thunderbolt rocket and its static test firing in 1973. See ‘The Rocket Research Institute, 1943-1993: 50 Years of Rocket Safety, Engineering and Space Education Programs’, George S. James and Charles J. Piper, in Jung, Philippe, ed., History of Rocketry and Astronautics, AAS History Series, Vol. 22; IAA History Symposia, vol. 14 (American Astronautical Society: San Diego 1998), pp. 343-400. And the Earth is very, very definitely round. As it has been known to be by educated European since the 9th century, and by the Greek astronomers long before that. All that stuff about how people in the Middle Ages believed the world was flat and that if you sailed far enough west you’d fall off was basically invented in the 19th century by Washington Irving. The Church Fathers knew and accepted that it was round. St. Augustine said so in one of his works, and argued that when the Bible spoke of the world as flat, it was an instance of God using the beliefs of the time to make His moral message intelligible to the people then alive. I’ve no idea where the modern delusion that the world’s flat comes from. Well, actually, I do – it seems to have started a year ago in 2017 with the comments of a rapper on American radio. But before then I thought the idea was very definitely dead and buried. In Britain, the Flat Earth Society had dwindled to a single member. This was actually a physicist, who believed that the Earth was round. He used the Society to argue against dogmatism in science. And I thought he had packed finally packed it in, leaving the number of Flat Earthers in Britain at zero. Now it seems that there are any number of eccentrics, who believe the world is really flat. They’re completely wrong about that, including Hughes. This entry was posted on September 21, 2018 at 5:17 pm and is filed under America, Bible, Education, England, Germany, History, LIterature, Music, Popular Music, Radio, Science, Space, Sport, Technology. You can follow any responses to this entry through the RSS 2.0 feed. You can leave a response, or trackback from your own site. Thanks! This is one of the best blog posts I have seen this year. I was probably the youngest member of the BIS, long ago around 1958. 12 Bessborough Gardens and Sir Arthur C. Clarke! I too know about Sanger, mainly from his design for the “Antipodal Bomber, ” a Nazi ricket that could fly around the Earth, dropping bombs on selected targets. This rather one – ups Wells’ War In the Air, which had transcontinental blimp bombers. Hmm, he might have called it the “Circumpolar Bomber.” I will check that in my old copy of Willy Ley’s Rockets Missiles, and Space Travel (2nd edition). I spent two pleasant and instructive afternoons at his home. Wonderful ppl he and his family. Oh. I knew about Truax too, and some colleagues of his in New Jersey. Well, this is far more pleasant than the horrid BPS model! Thanks, George! I’ve immense respect for Willy Ley because of his refusal to work for the German military and the Nazis, unlike Wernher von Braun. The ‘Antipodal’ bomber rings a bell, but I do also remember the Amerika Bomber the Nazis designed, which was to be able to reach America on bombing missions. I think Braun and his commanding officer also designed a two-stage version of V2, which was intended to be a nuclear missile capable of hitting the US. It’s a very, very good job the War was won when it was. I have a feeling some of the narrative elements of the real secret aviation projects the Nazis were developing towards the end of the War have been used by those pushing the Nazi UFO myth. I think the myth itself got exploded after it re-emerged in the 1990s. It’s been going on in some form since the 1950s. This is the theory that UFOs are really secret Nazi craft. It’s been invented and pushed by old and neo-Nazis, like Ernst Zundel. One version has it that the UFOs were built from instructions received by mediums from an alien civilization at the star Aldebaran. After the War, the defeated Nazis supposedly established a new, secret base in the Canadian far north and then Antarctica. It’s utter, pernicious rubbish, and it worried some of the skeptical people interested in Ufology when some of the British UFO magazines started printing stories about Nazi flying saucers. I haven’t read Wells’ ‘War in the Air’, but it is mentioned in the introduction to one of his books I’m reading at the moment, ‘The Sleeper Awakes’. This also has a section where the hero and villain battle it out in the air, though this time they’re fighting in monoplanes rather than airships. ‘The Sleeper Awakes’ was published in the 1920s, and was a revised version of his ‘When the Sleeper Wakes’, written in the late 19th century about a decade before the Wright Brothers, when many SF writers still believed heavier-than-air flight was impossible. They also forecast aerial warfare, as you said, but had it fought with airships. Von B’s superior was Walter Dornberger, a very smart officer. Here is the Bomber, well worth watching. https://youtu.be/ZVGsJIc5I8U . I eulogies Willy Ley and more in 2007. I will send it to you. Thanks for the links to the YouTube video about Sanger’s orbital bomber and the piece on your blog where you celebrate Willy Ley. Very interesting, and I have immense respect for your Dutch partner’s father for his subtle defiance and sabotage of the Nazi war machine. Even if he was doing this very subtly, through deliberate mistakes in the design, it must still have taken immense courage. As for what he said about von Braun, that does sound about right. I read somewhere that he was a mediocre pupil before he got interested in rocketry. Patrick Harbinson, in his book ‘Projekt UFO’, reckons that von Braun took much of the design of the V2 from a pamphlet published by Robert Goddard, the American rocket pioneer. The book, ‘Projekt UFO’ is interesting about what it says about the people behind the Nazi flying saucer myth, but it’s conclusion is utter rubbish. Harbinson really does seem to believe that the Nazis built flying saucers, which are flown by cyborgs from their secret base at the South Pole. That’s complete nonsense, but it sounds like his assessment that von Braun and co. plagiarized Goddard’s ideas might actually be right.